This summer I acquired a small, antique bull-dozer. I didn’t have any use in mind for it, but the prices was too good to pass up. The first day I drove it was quite an education. For one, there are two directional handles rather then a steering wheel, and curiously, this machine had two shifters. After I figured out the gear pattern, I drew a guide onto the hood with permanent markers. The left hand shifter is in the center, the the right hand shifter is blue. I also made a reminder to turn the gas off. 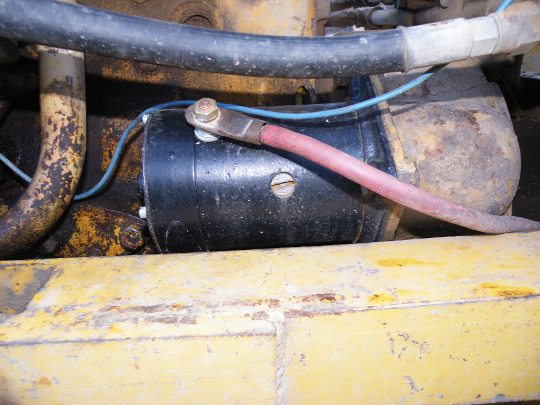 This dozer has quite a bit in common with a 8n ford tractor, and one of those things is the “gas ball”, which tends to leak if it’s not turned off. Another point of education was the way in which the crawler is turned off. You see, there is no key switch, and no off button to be found anywhere, until my brother showed be the button on the magneto. 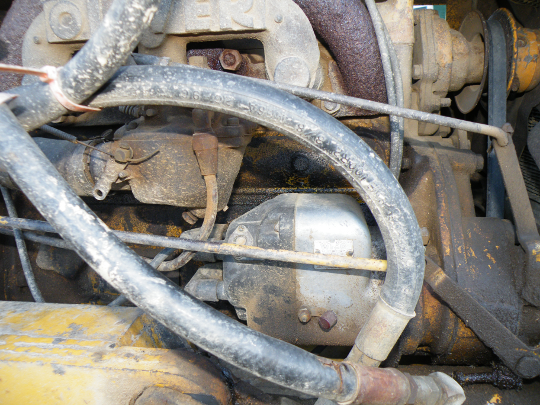 Once pressed, the engine will turn off immediately, which was a lot easier then trying to stall out the engine. The initial education paled in comparison to the lesson this dozer would give me about mechanics. One day while grading some soil in the backyard, I noticed a bolt sitting on the ground. I panicked, and after following a bit of spilled oil, I found where the bolt should be located. 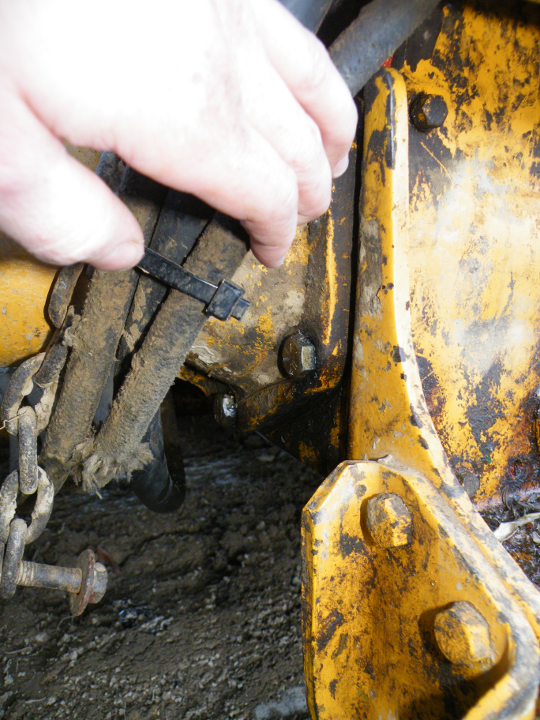 You see the dozer must have given the previous owner lots of trouble, and most of the bolts connecting the final drive to the differential were stripped out, and barely holding the pieces together. At first I believed the machine was lost until I talked to my buddy Shane. He advised that this would be a fairly simple fix if the right tools were used. I soon learned that a bolt could be used as a make-shift tap, to re-tread the bolt holes in the differential. To use a bolt as a tap: Cut a long groove into the side of the bolt, and slowly turn the bolt into the hole which needs new threads. For every three turns forward, turn once backwards to catch any metal fillings. A bolt will only tap one or two holes, but that’s far easier then purchasing a tap set. To really hold the bolts in place, we added nuts and lock washers on the inside of the differential. I couldn’t believe it worked so well. I also figured out that the battery was bad, and the alternator pulley was just fine. I guess people who work at a battery shop wouldn’t know to look for this. Once the battery was replaced, that machine stopped stalling, and I haven’t jump started it since. 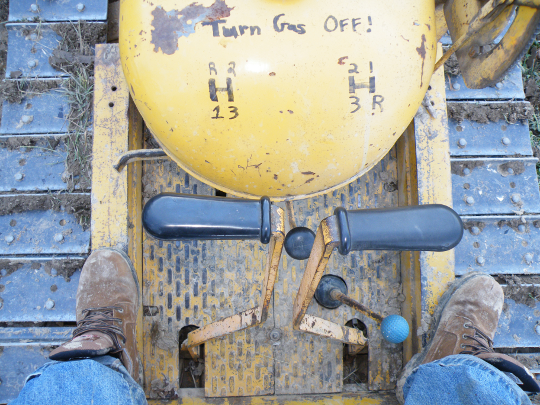 After all the work, and lot’s of learning, the dozer is now one of my favorite toys. I’ve been using it to flatten out my yard, between my porch, and the now nearly finished shop. 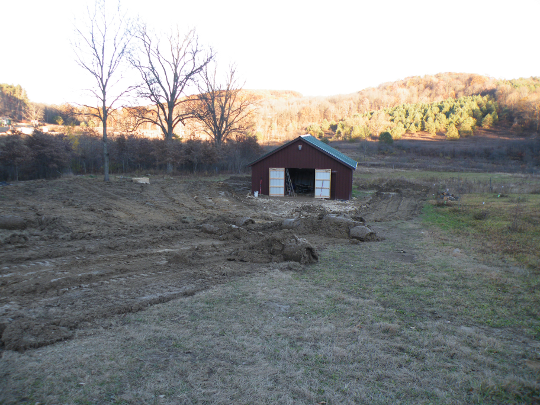 I’m about half-way done, and should be ready to re-seed it before spring.